It can be confusing when you first venture into the world of cryptocurrencies to understand the intricacies of different wallets. Between hardware, hierarchical deterministic, and multi-sig, there is enough terminology to confuse anybody. This guide is going to break down the need-to-knows when choosing cryptocurrency wallets. Simplified Definition: A cryptocurrency wallet is a piece of software where you can store, send and receive your cryptocurrency. Actual Definition: A cryptocurrency wallet is a software which tracks all the transactions on the blockchain for a specific cryptographic key and allows its holder to perform transactions on the blockchain. Every wallet consists of a public address and private key. As the same suggests, the private key you must keep it safe and share it with no one. On the otherhand, you will need to share your public address (aka public key) should you wish to send/receive money from/to your wallet. Instead of introducing all of the boring terminologies before presenting the wallets to consider, we are going to flip it and present you with some wallets you can consider straight away. We will delve into some of the features which put them on this list and you can not only quickly find wallets which may serve your needs, but you can also learn the boring terminology at the same time. For the everyday user, there is no question about it. Hardware wallets are the gold standard of security. When users hold multi-million dollar amounts, there are specialised security services but the everyday hodler can reach an extremely high level of security by using a hardware wallet. They are called hardware wallets because the wallet is a hardware device which is purchased, similar to a USB. There are a small number of hardware wallets which are leading the market. These are Trezor, Ledger Nano S, and KeepKey. We will cover Trezor and KeepKey in more detail later but Ledger Nano S makes this list because it has the widest support for altcoins. Ledger Nano S supports over 700 cryptocurrencies. The first thing which should be noted about cryptocurrency wallets is the private and public key. These can be compared to an email address. If you want to be able to receive emails from friends or colleagues, you can share with them your email address. They can easily use the address to message you. You would never share your password with them. The password would enable them to be able to access your account and sensitive information. The public and private key function similarly. If you wish to receive funds, you can share your public key and users can use this public key to send funds to you. Your private key is the key which enables you to access and send these funds. If you share your private key, users would be able to access and steal your funds. One of the most attractive features about a hardware wallet is that the private key is stored on the device itself. Users can access the wallet via importing it into a computer similar to a USB. A password will be applied so that even if the device is lost or stolen, no one else will be able to access it. If users lose their wallet, they will be able to recover it on another Ledger Nano S with a recovery phrase which is recorded when initially setting up the wallet. Recovery phrases and seeds are common among wallets and it is important that they are recorded carefully and not shared with anyone. If someone accesses the recovery seed to a wallet, they will also be able to recover and access the wallet. The wallet is hierarchical deterministic (HD). That sounds complicated but it essentially means that the wallet has the ability to generate multiple sets of private and public key pairs. This can be useful in a number of ways. By generating multiple public keys, it helps protect the user’s privacy. With the blockchain being publicly available to be analysed, if an identity is linked to an address, anybody can know the wallets details. By generating a new public key for each transaction, a user protects against this. One term that will be often heard in wallet terminology is hot storage and cold storage. This does not mean that your wallet is overheating from hodling too many cryptocurrencies. Cold storage means that your funds are secured offline. Storing funds offline is preferable to online as it removes the risk of being connected to the internet. Hot storage means that your wallet is connected to the internet along with your funds. Another attractive feature about hardware wallets is that users can benefit from the enhanced security of cold storage while being able to avail of hot storage when needed. While other types of wallets do not offer the same security as hardware wallets, there are other top-tier wallets that provide different benefits and drawbacks. Exodus is one of the most popular and widely used desktop wallets. The wallet supports almost 100 cryptocurrencies and puts users in control of their own private key. The private key for the wallet gets stored on the user’s device. One of the main features of the wallet which makes it popular is the easy-to-use interface. 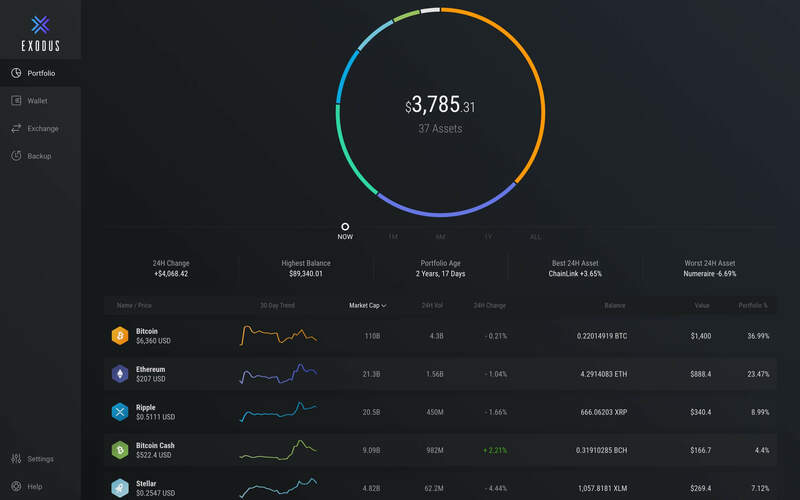 Users can easily navigate through the wallet and view their cryptocurrency holdings at a glance. It is also easy to receive and send transactions in different cryptocurrencies. When users set up the wallet, they will be provided with a recovery seed so that the account can be easily recovered if something were to happen the device. In contrast to hardware wallets, Exodus does not require any cost to set up. Users can easily download the wallet from exodus.io. The wallet is supported on Linux, Windows, and OSX. Wallets can also be used for their interactive capabilities. Coinbase has a wallet which is separate from their exchange services. The wallet, previously known as Toshi, facilitates sending, receiving, and storing Ethereum and Ethereum-based tokens. The wallet is limited in terms of its support for cryptocurrencies but the wallet enables users to interact with decentralized applications (DApps). The Coinbase Wallet does not want to be only a place for securing and transacting with cryptocurrencies. The wallet aims to provide a wider ecosystem where users can interact with apps, pay merchants, and integrate with exchanges. Different wallets come in different forms. Ledger Nano S is a hardware wallet and Exodus is a desktop wallet. The Coinbase Wallet is a mobile wallet. The private keys of the wallet are secured on the mobile device putting the user in control of their funds. Mobile wallets also enable users to easily receive and send cryptocurrency transactions. As we delve deeper into the different types of wallets and considerations, the benefits and drawbacks of each type will become clearer. Why Do You Need Wallets? When wondering why you really need a cryptocurrency wallet, you should first consider what cryptocurrency is really for. The Bitcoin whitepaper published by Satoshi Nakamoto on the 31st October 2008 proposed a peer-to-peer cash system that removed the need for intermediaries and middlemen. The system used a decentralized network of computers expending power to build the trust that the intermediaries and middlemen have always provided. If you buy cryptocurrencies and you leave the funds on an exchange, you are essentially returning to trusting an intermediary. The only way you can be in complete control of your cryptocurrencies is to own your own wallet and control the private keys. While some users of cryptocurrency are only interested in speculation and do not worry too much about not being in complete control of their funds, there are also other factors to consider. Cryptocurrencies is an emerging field and has only been developing for around ten years. This means that many of the businesses being set up now are destined to fail in the years and decades ahead. This includes exchanges. By leaving funds on an exchange, users take extra exposure to the risks. By owning cryptocurrencies, users expose themselves to the uncertain future for the cryptocurrencies that they own. By also leaving these on an exchange, they expose themselves to all of the business risks that the exchange has including hacking, malfunctions, and bankruptcy. This extra risk can be avoided by simply securing the cryptocurrencies within a wallet. We have already covered hardware wallets, desktop wallets, and mobile wallets. There are other forms of wallets also including paper wallets, web-based wallets, and exchange wallets. Each type of wallet has their benefits and drawbacks. Security is typically the most important factor to account for and the following are presented in order of best security. Hardware wallets use a high level of encryption to provide the best possible security to the funds stored. These devices leverage the best benefits of both cold storage and hot storage. The private key is stored on the device itself and even if a user accesses the wallet on a compromised device, the funds will still be secure due to the high level of encryption applied. Apart from the price, hardware wallets tick all the boxes when it comes to security and features. If purchasing a hardware wallet, it is important to purchase the device from the official retailers. There are numerous fake versions online which would only serve to put a user’s funds at risk. This type of wallet should only be used if the user is comfortable knowing how it works. Paper wallets are exactly what they say they are. They provide both a public and a private key printed on paper. Paper wallets can be generated from online services such as walletgenerator.net. Users can use the public key to receive cryptocurrency transactions. It is important that the paper wallet is generated for the cryptocurrency that the user wishes to store as different cryptocurrencies will have different public and private key formats. One of the key benefits of paper wallets is that funds are stored completely in cold storage. When the funds need to be accessed, there are services online that enable users to import their paper wallet such as blockchain.com. The key drawback with paper wallets is that if anybody gets access to the paper, they will know the private key. For this reason, extra measures are typically taken to store the paper securely or to store halves of the private key in two separate locations. There can also be difficulties with the importing part if the user is not comfortable with how wallets work. Desktop wallets come in a wide variety. Desktop wallets will typically store the private key of the wallet on the users hard drive. This is a secure way of holding private keys as it mostly keeps the private keys offline. The main risk with this type of wallet is if the device gets compromised. Devices which are hacked will have a serious risk of losing their funds. Where the private keys are stored on the device is another key point to note. If the private keys are stored in a cloud-based storage system, this also runs the risk of the private keys being accessible to third parties. It is also important for users of these wallets to carefully record the recovery procedure. In the case that the device gets lost or stolen, users will be able to recover the wallet and funds from another device via the recovery phrase. While the private keys are secured offline, users can still benefit from the features of being connected to the internet via the wallet interface. Mobile wallets are similar to desktop wallets in the manner that they come in a wide variety and mostly store the private key on the device itself. While mobile wallets are typically not as secure as desktop wallets, they have a number of benefits in terms of convenience and functionality. Wallets such as Coinbase Wallet enable users to interact with DApps. It is also easy for users to make and receive payments as they conduct their daily activities. Users can easily use mobile wallets to make payments to merchants who accept cryptocurrencies. A QR code can be easily loaded from the wallet to accept payments. Some mobile wallets will be far less secure. It is important to research how each mobile wallet secures the private key before using significant funds with these wallets. Web-based wallets are a poor form of security for funds. They typically store the private key with the third party that is providing the wallet. Sometimes, the private key is encrypted so that access to it is limited. This is better than a web-based wallet without encryption but it is still a poor level of security compared to the higher tiers of wallets as encryption can be decrypted. Other web-based wallets also enable the users to add a further layer of security to the wallet by adding their own password. This is better but web-based wallets remain one of the lowest quality of wallet in terms of security. Exchange wallets vary widely based on the exchange operating the wallet. These are the lowest tiers of wallets in terms of security as in most cases, users have no idea whether the funds are even there. By leaving your funds on an exchange, users give up control of the funds to the exchange. Exchanges may only reserve a fraction of the funds and use the rest to make risky investments. Some exchanges such as Kraken have applied methods where users can verify that the exchange holds the funds for their account but in most cases, there is no way to verify this. Many exchanges also pool all of the user’s funds together as opposed to providing a secure account for each. This represents an even further risk if the main account is hacked, all of the user’s funds are at risk. Exchange hacks such as the 740,000 Bitcoin stolen from Mt.Gox are clear examples of this. You have now arrived at the stage where you want to choose your wallet. We present the key factors to take into consideration when deciding on the wallet. Not every wallet supports every cryptocurrency. The reality is far from it. Most wallets will focus on just a few cryptocurrencies. Some might specialise on just one cryptocurrency. There are also wallets such as Ledger Nano S that provide support for a huge amount of cryptocurrencies. What cryptocurrencies a wallet supports is an important consideration when choosing a wallet. If users have most of their portfolio in one cryptocurrency such as Monero, they need to make sure that the wallet chosen is going to have support for this cryptocurrency. Will the funds be stored in hot storage or cold storage? While features and functionalities add to the attractiveness of a wallet, it’s first and foremost function should be to secure your funds effectively. For that reason, the security features of a wallet should be the first consideration when making your decision. Building a reputation among wallet providers is not an easy thing to do. There are so many wallets available that users can often leave bad reviews for a wallet even if one or two features are substandard. The wallets which have a high reputation and level of trust among users have typically earned it. This makes the reputation among other users a valid consideration when deciding on a wallet. While secure wallets can sometimes be complex, it is not advisable for users to adopt wallets that are so complex that they cannot use it or understand it. Using a wallet which the user does not understand represents more risk than it is worth. The high security of the wallet will not matter if the user loses access to the wallet. This can often be a tradeoff when it comes to wallets. More portable and convenient wallets may have lower levels of security. It is important for the user to consider what the wallet will be used for. If it is going to be regularly used to make payments to merchants, a mobile wallet may be the best option. If it needs to be highly secure but also portable, hardware wallets would likely be the best option. Recovery options are key to wallets. Having a wallet without a recovery option is like having all your funds secured by an unbreakable lock without having a second key. If you lose the only key, the access to the funds is gone. Any wallet worth its weight in Bitcoin will have a clear and easy-to-understand recovery process. It’s important to pay close attention when setting up the recovery process. If a wallet has already been set-up and the user is unsure of how it is recovered, another wallet should be set-up with a recovery option and funds transferred to it. While hardware wallets are the best and most secure option. They are not within everybody’s budget. Everybody individually needs to assess whether a hardware wallet is worth the investment. The price varies between the hardware products. If users hold a large number of cryptocurrencies, the extra cost will be worth the security. If users only own a small number of cryptocurrencies, it is likely not worth it. For example, if users own $500 worth of Bitcoin, spending $100 on a wallet is 20% of the entire portfolio and could be alternatively used to increase their holdings. It is an entirely different case if the user holds $10,000 in cryptocurrencies. Purchasing the hardware wallet would just be around 1% of the value of their portfolio and would provide the gold standard of security. It is advisable that everyone individually decides the point at which they will invest in a hardware wallet. Readers should now be familiar with both the types of wallets and the key considerations when choosing one. Taking these into account, we present more top-tier wallets that perform well across the key considerations. Developed by SatoshiLabs, a company founded in 2013, Trezor is a hardware wallet launched a mere year after. This means it has the longest history of operation of any major hardware wallet providers. So it is really no surprise it is so well-known, and probably has the best reputation among its users. Although Trezor does not support the same variety of cryptocurrencies when compared to Ledger Nano S, users can rest assured it does support most major cryptocurrencies. Designed to make the set-up as clear and straightforward to users as possible, this wallet prides itself in the user-friendliness department. Generally, hardware wallets can be somewhat more complex than other kinds of wallet, nevertheless Trezor offers easy-to-understand instructions to the user. Trezor offers two different models, each with varying features. The Trezor Model One was the initially released product in 2014. The recently released Trezor Model T sells for a higher price. The main differentiator is the Trezor Model T has no buttons and its functionality is controlled by a colour touchscreen. To ensure maximum convenience, SatoshiLabs even provides a selection of other applications and features which can be used with this hardware wallet. Users can use the Trezor to create and/or their passwords via the Trezor password manager. It is good to highlight the fact that this application uses a high level of encryption to secure passwords for different accounts, guaranteeing that they are not accessible to third parties. While Trezor has a more expensive price tag than Ledger Nano S, the stellar reputation SatoshiLabs carries with it more than makes up for the price gap. Most importantly, Trezor boasts of a high level of security – something every customer looks for when investing their money. Add accessibility (thanks to the straightforward set-up instructions) to the mix, it is really no mystery why users should opt for Trezor when choosing their first hardware wallet. KeepKey is yet another major player within the hardware wallet world, albeit lesser known. While it is priced higher than its competitors, it still provides a high level of security and valuable features (such as integration with ShapeShift to facilitate exchange between cryptocurrencies) which other hardware wallets lack. This is an advantageous element could easily be the deciding factor when customers are still in their decision-making process when choosing a wallet. Supporting more than 30 cryptocurrencies, KeepKey is also hierarchical deterministic and the code for the wallet is an open-source, enabling the development community to evaluate the security standards of the wallet. And while it is not as well known as Trezor and Ledger Nano S, KeepKey is still a top-contender definitely worth investing in. The Ledger Nano X has a 128×64 display screen that displays all the data regarding your transactions. You control the device using 2 small buttons. The device is also has a built in 100 mAh battery which lasts for hours when the device in use regularly. Since Ledger Nano X uses a highly secure chip, similar to the one used in credit cards, and since is not directly connected to the web, it is virtually impossible for hackers to steal your coins from this hardware wallet. With such a fact taken into consideration, Ledger Nano X’s price tag of €119 is pretty reasonable. If €119 sounds expensive, you can check its predecessor, the Ledger Nano S hardware wallet, priced at €59. CoolWallet can be used to store, swap, send and/or receive cryptos with a mere click of a button. Unlike other hardware wallets like Trezor or Ledger, which needs to be connected to a computer or laptop via USB, CoolWallet is designed to connect to a smartphone via Bluetooth or NFC (Near Field Communication). Its physical appearance also differs from the other cold storage wallets, in that it looks exactly like a credit card with a button and an integrated display. Owing to a great strategic investment from SBI Holdings (previously called Soft Bank) in 2018, the company introduced the S version of its wallet. This product aims to provide an accessible, safe and sophisticated, lightweight mobile-based hardware wallet for those who would like to trade and secure cryptos on the go. As it uses a highly-secure element (SE) to store the private keys, it is basically impossible for hackers to steal coins funds from this wallet. Apart from passcodes and touch ID, CoolWallet also makes use of facial recognition to provide 2+1 Factor Authentication to secure customers’ digital assets. Moreover, this credit card-sized wallet offers a complete offline storage for users to save their crypto-based assets safely. On top of being super reliable and stable, CoolWallet S is also waterproof, shockproof, tamper-proof, temperature-resistant and extremely simple to store and trade cryptos -even when on the go.